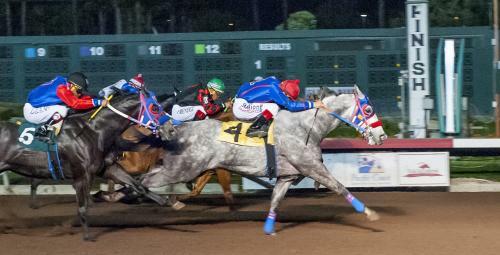 Alberto Rosiles’ Rite Quick sizzled at 100 yards on the way to winning the $18,000 The Blink Of An Eye Handicap by a head in a time of :06.536 on Friday at Los Alamitos. Trained by Yanet Rodriguez, Rite Quick won his fourth consecutive start and second in a row in 2019. The gelding by Favorite Cartel’s was only a few blinks away from track record clocking of La Sierran of :06.48 that she posted last October. Rite Quick is razor sharp as came into this race after winning his previous two starts at 330 yards. Bred by Dr. Steve Burns, Rite Quick raised his career bankroll to $30,870. Alberto Zepeda piloted Rite Quick for trainer Yanet Rodriguez. The now 4-year-old gelding was well regarded by his connections during his freshman and sophomore campaigns, as he participated in the trials to the Grade 1 Los Alamitos Two Million Futurity and in last year’s trials to the Grade 1 Los Alamitos Super Derby. It now appears that he has found a niche with the class relief and will be one to watch in the months to come. The complete order of finish is as follows: Kiss N Air, Snowy Coronitas, Jodee B Valiant, The Cartel Hawk, Seems Even Better, La Sierran and Indie Anna.